OUR INVENTORY OF FLORIDA CURRENCY IS THE LARGEST AVAILABLE ANYWHERE, AND OUR PRICES ARE ALWAYS FAIR! Lay-Away purchases & convenient terms available upon request. We have helped several customers complete their State of Florida note collections, let us help you complete yours. Everything we sell is guaranteed to be authentic and as described or your money will be refunded, no questions asked! We are reputable and have many references. Read the information below then go to individual pages to view current offerings. Tell us which item(s) you are interested in and we will answer any questions you may have to help you decide if you wish to make a purchase. STATE OF FLORIDA NOTES There were more than fifty varieties of notes issued by the State of Florida during the War Between the States (1861-1865) and one issue in 1870. Varying greatly in their rarity and obtainable grades, they are available in a wide range of prices. We always have a large selection available for you to examine. Click here to view our current offerings. 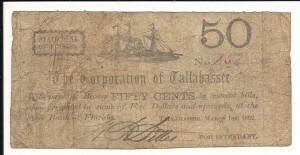 RAILROAD NOTES A number of independent railroads operated in Florida in the mid-19th century and four of them issued their own currency. They were the Florida Railroad which operated out of Fernandina, the Florida Atlantic & Gulf Central Railroad with headquarters in Jacksonville, the Tallahassee Rail Road with offices in the capitol city, and the Lake Wimico Canal & Railroad Company in St. Joseph. While many Tallahassee Rail Road notes are generally available (beware of the many reproductions! ), the notes issued by the others are usually difficult to obtain, with some extremely rare. We always have a good selection of railroad notes available. Click here to view our current inventory. DEPRESSION SCRIP During the Great Depression of the 1930’s, U.S. government currency was often scarce. To facilitate commerce during this shortage many banks, businesses and local governmental agencies issued their own scrip. This scrip was issued inlimited quantities and most of it was redeemed, leaving very little for collectors. 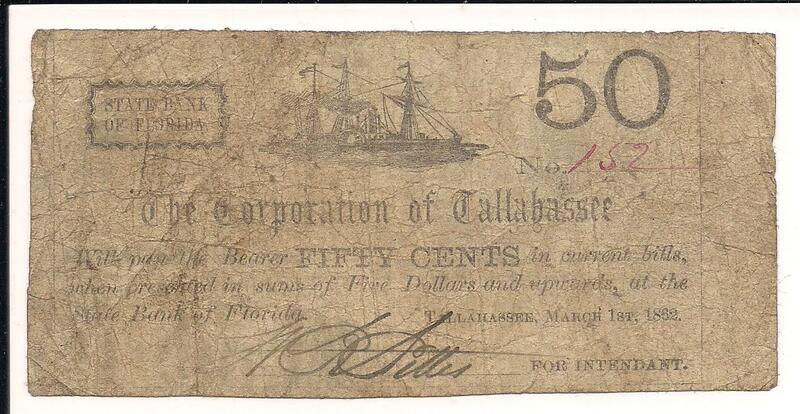 We are pleased to offer some of these notes that were issued in Florida. To view them, click here.